← Welcome to our TIMEBANDITS Blog! 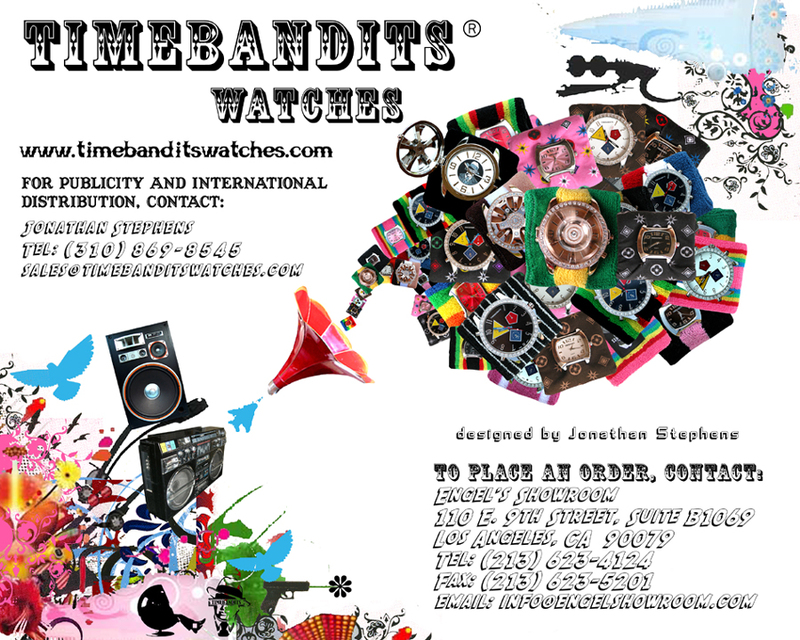 TIMEBANDITS is a line of sweatband watches designed by Jonathan Stephens. TIMEBANDITS has successfully created the perfect hybrid accessory of the future. Our product offers a unique blend of trend and practicality, fusing retro-style watch faces with an array of funky sweatbands. Timebandits watches have a special quality that appeals to any type of person, regardless of age, gender, race, or class. By colliding elements of the past with the future, we have been able to produce an innovative fashion accessory for the retro-future consumer. Our product is currently being worn by Hollywood’s celebrity elite such as: (SO YOU THINK YOU CAN DANCE CONTESTANT: Sara Kei VonGillern), (AMERICAN IDOL CONTESTANTS: Sanjaya Malakar, Chris Richardson, and Blake Lewis), Paris Hilton, SNOOP DOGG, Nicole Ritchie, NICK VERREOS from Project Runway, Jack Osbourne, Flavor Flav, Haylie Duff, Pamela Anderson, Fergie of the Black Eyed Peas, Naomi Watts, PEREZ HILTON, Jenny McCarthy, the band 311, and many, many more. Our product has been featured in many magazines such as Teen Vogue, US Weekly, People, Blender, Glamour, Details, Vanity Fair, GQ, Vogue, Wad (France), Max (Germany), Maxim (Italy), ViVi (Japan), and many more. Sara Kei VonGillern rocked her TIMEBANDITS watch on 2 episodes of “SO YOU THINK YOU CAN DANCE”. Perez Hilton can be seen on the new cover of URB Magazine rocking his TIMEBANDITS watch! AMERICAN IDOL CONTESTANT Sanjaya Malakar can be seen wearing a TIMEBANDITS watch in a recent issue of US WEEKLY Magazine. Snoop Dogg rocked our wristband watches on his #1 hit video “Drop it Like It’s Hot” which has aired in heavy rotation on MTV, BET, and VH1. Snoop was also seen wearing Timebandits Watches on Live 8 on MTV/VH1 which was broadcast to over one billion people tuning in worldwide. Many major US television programs such as So You Think You Can Dance (Fox), Project Runway (Bravo), The Simple Life Goes to Camp (E), Flavor of Love (VH1), The Andy Milonakis Show (MTV), CSI (CBS), Law and Order (NBC), TRL (MTV), Rap City (BET), Tonight Show with Jay Leno (NBC), Pepsi Smash (WB), My Wife and Kids (ABC), Party at the Palms (E), and many other shows have featured our watches on the air. This entry was posted in Fashion, TIMEBANDITS and tagged , bling bling, celebrities, celebrity accessory, celebrity style, designer watch, fashion accessory, retro style, spinner watch, sweatband, sweatband watch, sweatband watches, TIMEBANDITS, TIMEBANDITS watches, toy watch, urban accessory, urban style. Bookmark the permalink.